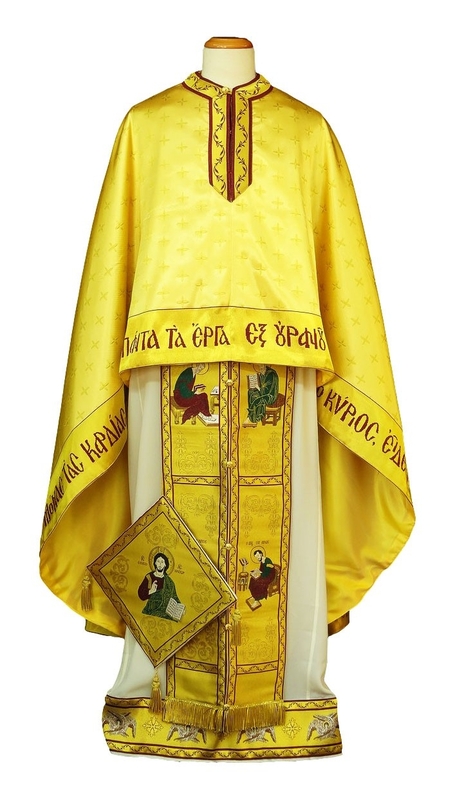 Orthodox Church liturgical Greek Priest clergy vestments (yellow-gold) by Istok Church Supplies Corp.
Istok Church Supplies has an outstanding collection of high quality Orthodox Christian Greek Priest vestments in yellow and gold. In our bid to preserve and promote the glorious traditions of the Orthodox Christian faith, we offer these vivid hued liturgical vestments in canonically correct style so that they enhance the prestige of the wearer. 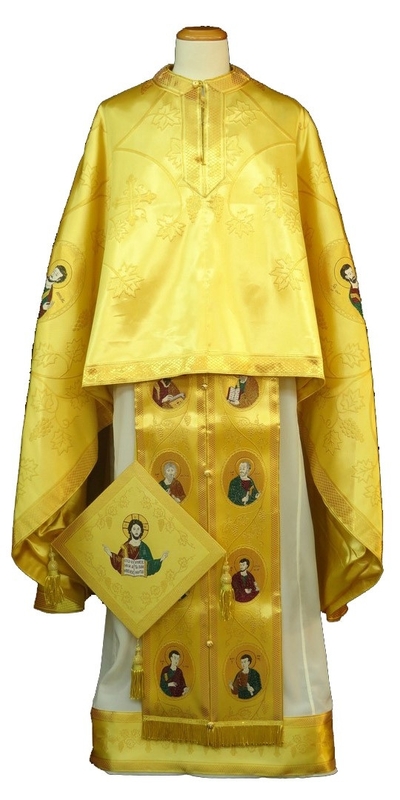 Yellow is the color of virtue and our resplendent Greek Priest vestments in yellow and gold are suitable for a wide variety of liturgical occasions honoring our Savior Jesus Christ, Apostles, the Holy Hierarchs and on Sunday services. These ecclesiastical garments are offered as complete sets containing five items – epigonation, zone, phelonion, epimanika and epitralhilion. Customers can select from three fabric options – rayon jacquard brocade, metallic jacquard brocade and embroidered vestments made with fine quality German threads. Patterns range from elegant and simple to ornate and intricate. We offer plenty of opportunities for customers to upgrade their orders. 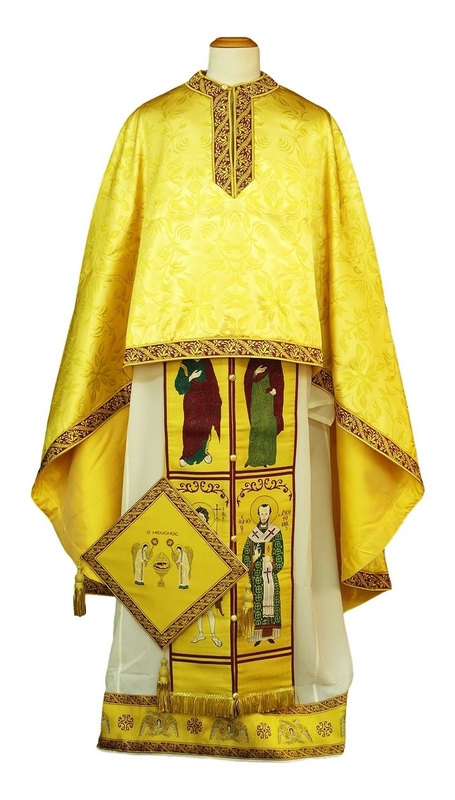 Customers can add natural velvet inserts, a matching podriznik, complimentary chalice covers and an embroidered icon to enhance the value and appearance of custom Greek Priest vestments yellow and gold. Customers can choose from three types of decorations for their custom order. For standard type decoration, we incorporate economic galloons and simple crosses. For premier decoration, we include high quality galloons and embroidered crosses and for luxury type decoration, we provide solid jacquard galloons and rich hand embroidered crosses. We are experts at delivering custom vestments that fit the wearer perfectly. Once you send in your individual measurements and customization requests, our devout tailors in Europe will begin working on your custom order with attention to detail and high quality workmanship. The creation process is a labor of love that can take several weeks for completion. We request your patience and early order placement – we are confident you will be satisfied with the end results. Try our online shopping experience and we are sure you’ll never want to go anywhere else!